I just posted my Year in Review a few hours ago. 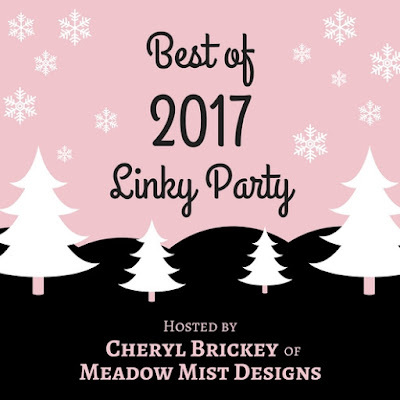 But when I saw that Cheryl of Meadow Mist Designs was hosting a Best of 2017 linky party, I couldn't pass up the chance to join! I had a lot of fun sharing my quilting journey on this blog last year, some of it sad, some of it disappointing, but most of it very, very good. When I tried to come up with posts to highlight, I started thinking about the "best" awards they passed out in high school. (And for the record, I was most "multi-faceted" in high school.) So here are the quilts / posts representing my best and worst of 2017! Yoyogi Park was a quilt whose pattern is from the first season of the Midnight Quilt Show. The pattern is cute and I love the fabric, but my most exciting moment regarding this quilt? Angela Walters repinned this quilt on one of her Midnight Quilt Show Pinterest boards. I had a total ohmigosh moment when I saw that! I was initially attracted to Think Pink because of the prospect of quilting those beautiful and mesmerizing spirals inside all the irregular spaces. But that's also why the quilt took forever to quilt. It did finally help me get comfortable with rulers though, I must say! (And with starts and stops. Lots of them.) But it was definitely worth it! Well, they can't all have a happy ending. Take Shape is a quilt that combines a beautiful fabric line, good piecing job, and nicely executed quilting for a truly disappointing finish. The reason? The fabric just didn't go with the pattern. It actually looks good when it's folded up, and also when viewed closely, but when I step back, my eyes hurt. If I had to name a time last year that I came the closest to crying about a quilt, it was when I decided I needed to abandon my Aviatrix Medallion quilt. It was a beautiful kit that took me months and months to piece, so needless to say, deciding to rip it apart was a heart-wrenching decision. I still get upset when I see it. Now, everybody who sees the pictures say it's a beautiful quilt and they wonder why it makes me so sad. Well, let's just say that the photographs were strategic. In reality, I don't know if this quilt can be salvaged, and even if it can, I don't know if I have the patience. There are simply too many new projects I want to do! I love Flux. I really, really love Flux. The fabric is from Avant Garde which is my favorite collection of 2016, and the pattern shows it off perfectly. I had lots of fun quilting it to death with all my craziness, so while it's not the cuddliest quilt out there ... I absolutely love the way it looks! It was super fun going through my blog posts of 2017 to find ones to highlight, whether they are posts that made me happy or ones that made me sad. I don't think I'd be nearly as motivated to quilt if I wasn't able to blog about it. But all in all, 2017 was a fabulous year for quilting, learning, sharing, and I hope 2018 is great as well! I love the way you did your favorites list. Surprised to see on called saddest moment, but, it does happen. I hope you are able to make peace with it someday or someway. I just saw an episode on Alex/Ricky show where a woman cuts up and reassembles a quilt she has made. Not sure its a solution - but any redoing feels really traumatic to me. Best wishes for a terrific new year. I enjoyed revisiting some of your beautiful quilts from 2017, Liz. I'm touched that you shared all your feelings about them, both happy and hard emotions. I loved seeing all of your quilts again. Your quilting is beautiful. Like Louise, I want to do a quilt using your Haphazard pattern so maybe you can host a quilt along, maybe in the summer? I played with the pattern when you first posted about it, and there are so many possibilities. Your quilting is simply amazing and I enjoyed the chance to revisit some of my favorites from 2017! Thanks for linking up and have a happy new year! I love how you labeled your 5 different posts, too. I can't imagine what's going on with your Aviatrix Medallion. It looks like it could get Grand Champion. Your Lakeshore quilt is my favorite. But no, all your quilts are my favorite!